Sen. Roland Burris says, "It is my belief the transcripts help set the record straight"
Burris says he didn't contribute because of potential "perception of impropriety"
CHICAGO, Illinois (CNN) -- Embattled Sen. Roland Burris insisted Wednesday that recordings of secretly taped conversations between him and former Illinois Gov. Rod Blagojevich's brother show no evidence of corruption in his U.S. Senate appointment. 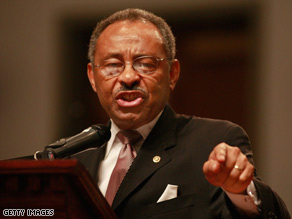 Roland Burris insists he never tried to buy his Senate seat. Burris, a Democrat, also reiterated that he did not commit perjury in previous testimony regarding his involvement in an alleged "pay-for-play" scheme to fill the Senate seat from Illinois vacated by President Obama. The lawmaker's denials came one day after a federal judge approved sending recordings of the conversations, which took place before Burris' appointment, to the U.S. Senate Ethics Committee. "I was truthful when I testified that at no time did I take any part in pay-to-play while lobbying for the Senate seat," Burris told reporters in Chicago. "Did I want to be appointed to the Senate seat? Yes, I did. ... Did I try to buy the seat? Never." Burris said he expects "the media and the public to review every word of the transcript [of the recordings] in context. At the end of the day, I expect both to judge me fairly. ... It is my belief the transcripts help set the record straight and should settle this issue once and for all." Burris then promises that he'll write the check by December 15. Throughout the talk, Burris presses Robert Blagojevich to tell him how he can help with the campaign without looking like he bought the appointment. "I'm trying to figure out how to deal with this and still be in the consideration for the appointment," he says. "I hear ya. No, I year ya," the governor's brother responds. "And, and if I do that, I guarantee you that, that will get out and people said, 'Oh, Burris is doing a fundraiser' and, and then Rod and I both gonna catch hell. ... And if I do get appointed, that means I bought it." Wright told the Chicago Sun-Times on Tuesday that the check would have been for $1,500 and denied that Burris' promise to write it was part of any "pay-to-play" scheme. "Fifteen-hundred dollars? Come on," Wright told the paper. "Burris had been a fundraiser in years past. This had nothing to do with pay-to-play." Burris, appointed days before the Illinois Legislature impeached the Democratic governor in January, never mentioned the conversations while testifying before the Legislature during Rod Blagovich's impeachment trial. Burris said Wednesday he didn't tell the Legislature about the conversations because he wasn't asked. According to Burris staffers and an affidavit obtained by CNN in February, Robert Blagojevich solicited Burris for up to $10,000 in campaign cash before he was named to his Senate seat. However, in the affidavit, Burris said he refused to contribute or to assist in fundraising. Rod Blagojevich, who was removed from office earlier this year, has pleaded not guilty to federal corruption charges. A federal grand jury indicted him in April on 16 felony counts, including racketeering, conspiracy, wire fraud and making false statements to investigators. The indictment also charges some of Blagojevich's closest aides and advisers, including his brother, Robert, in a wide-ranging "scheme to deprive the people of Illinois of honest government," according to a statement released by the U.S. attorney's office. Robert Blagojevich also has pleaded not guilty to the charges. According to the indictment, the governor schemed with others in 2002 -- even before taking office -- to use his position to make money, which they were to share after he left office. Among other allegations, Rod Blagojevich is accused of working with others to figure out how he could make money by appointing Obama's replacement. A lengthy FBI affidavit alleges that Blagojevich was intercepted on court-authorized wiretaps trying to profit from the Senate vacancy. The indictment said that Blagojevich communicated "directly and with the assistance of others" with people he believed were in contact with Obama -- trying to gain political favor by possibly appointing someone the president-elect supported. He ultimately appointed Burris, a former state comptroller and attorney general, who was seated in the Senate despite protests from Democratic leaders. If convicted, Blagojevich would face up to 20 years in prison for each of the 15 most serious charges in the indictment, and five years on a single charge of making false statements. CNN's Katherine Wojtecki contributed to this report.